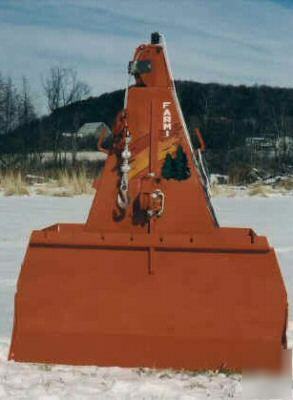 Brand New Farmi JL501 Logging, Skidding Winch with Dozer Blade. * Recommended Tractor size is 40HP to 60HP. * Suitable for Tractors with Cat 1 or 2, 3 Point Hitches. * 3 Keyhole Sliders on the Cable. * Clutch Plates are 3/8" Thick and secured with 12 Rivets. * Plus, the Model 501 has an adjustable Lower Snatchblock and 2 Tool Pockets. * Pulling Capacity is 11025lb's. * Drum Capacity is 265' of 3/8" Cable. * Winching Speed is 1' to 5' per second!